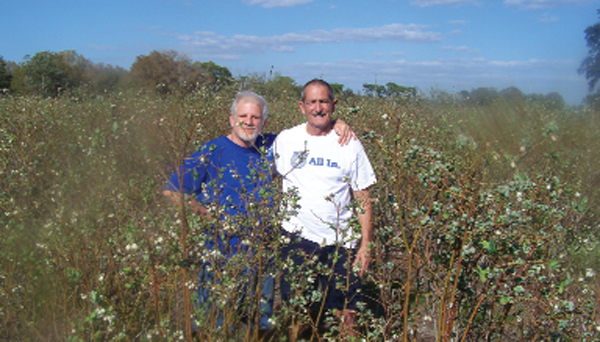 Barventa Farms owners and partners Tom Vena and Dave Barbarossa pose amidst their blueberry bushes loaded with blueberries. It’s blueberry season, and local farmers are opening their blueberry fields for u-pick. Stafford U-Pick Blueberries is located at 3111 John Moore Rd. in Brandon. Doug and Joy Stafford welcome kids and adults to pick five varieties of blueberries on their two acres. “We are very family friendly, and we will be having preschool groups of parents and children pick for the first time this year,” shared Doug. “We have a photo op bench where groups can stage pictures, and we will be selling blueberry bushes and blueberry honey.” Visitors might even spot two heifers named Dancer and BLB on the property. “We hope to open the first week in April, for about six to seven weeks,” said Doug. “We will be open Monday, Wednesday, Friday and Saturday, 8 a.m.-5 p.m., and Sundays, 2-5p.m. For information, call 340-4382. or e-mail staffordblueberries@gmail.com. Big Bear Farms, Inc. is a certified organic farm in Plant City, located at 7606 Kinard Rd. Owner Kenneth Der invites families to pack a picnic and come out and pick some sweet blueberries. “It is cheaper to pick our organic blueberries than it is to buy organic blueberries in the grocery store,” said Der, who also grows a variety of other organic fruits and vegetables. “Children get a chance to see where their food comes from.” This family-owned farm will be open April-May for blueberry u-pick. Visit bigbearfarms.mysite.com for more details and other crops updates or call 986-1152. Moody Blues Farm will also have certified organic blueberries available late March through May for u-pick by appointment. The farm is located at 404 Cloverleaf Dr. in Lithia. Visit moodybluesfarm.com or call 684-8468. Barventa Farms is a pesticide-free farm located at 6633 Simmons Loop, in Riverview. Owners and partners Tom Vena and Dave Barbarossa welcome families to their farm for blueberry u-pick starting around the first of April through the end of May. “We have a very sweet berry,” said Vena. “Blueberries that are bluish purple to almost black are the sweetest.” This farm will be open Monday-Friday, 9a.m.-5 p.m. and Saturday-Sunday, 8 a.m.-5 p.m.
For more information, call 672-1371, e-mail bfarms@barventafarms.net.or visit www.barventafarms.net. Frosty Blue Farms, Inc. is located in Lithia at 1907 Streetman Drive. The farm will open for blueberry u-pick around the last two weeks in May. U-pick will be weekdays by appointment and Saturdays, 9 a.m.-4 p.m. Owner Wendy West said it provides buckets for picking and bags for taking berries home. For information, call 689-7703 or e-mail lwnole@earthlink.net. Keel & Curley Winery will hold its fourth annual Blueberry Festival on Saturday, April 30, from 8 a.m.-6 p.m. and Sunday, May 1, from 11 a.m.-6 p.m.
For more information, visit www.keelandcurleywinery.com/events.